The same songs come back to me insistently tonight in the booming silence – booming because I am wearing ear plugs and while I can hear “nothing”, the sound of my heart is loud and rhythmic, a metronome for the imagined music. The earplugs are a little uncomfortable and I know I will end up taking them out eventually, but for now they insulate me from mosquito whine and from the noise of that bar at the end of our street. That bar. It is the nearest to our front door but we have never set foot in it. It is a charmless place – ridiculously lively at, say, 1am on a Tuesday night. It is the enemy of a good rest. 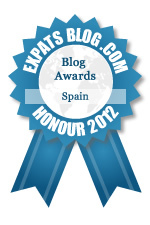 Owned by expats, it is trendy enough to have a website which I visited once while plotting its downfall. There’s a page on the history of the bar. The history for God‘s sake – it only opened in 1997, a year described on the page as “the Dawn of Chillout”. The Dawn of Chillout? Get a grip. I’ll be a happy man when the sun finally sets on “Chillout” if that bar is anything to go by. The Dusk of Chillout. It can’t come soon enough. And then The Night of Sleep. K is peaceful next to me. Working in Gibraltar she doesn’t get Spanish holidays, so wasn’t around on January 5th for the first of two (!) processions we had in Tarifa that day. They do love a good procession, the Tarifeños. Noise alerted me to the first. A cacophony. Faint at first it grew closer and louder in a metallic crescendo that I couldn’t identify. I went to our little balcony and looked down at the townspeople as they made their way along the street below, their children’s hands in theirs. They looked relaxed and strolled along either in silence or chatting quietly. The scene was almost solemn. So where was the noise coming from? Each child – with its free hand – was pulling along a string behind it to which it had attached a number of tin cans. The streets in Tarifa are narrow and cobbled so the noise making strategy was highly effective, to say the least. This instruction – at such an early age – in the art and appreciation of excessive and pointless sound generation explains much that I have seen (heard) in Spain. I realise it’s not the done thing to make sweeping generalisations about the place one has chosen to live in, especially when one has only just arrived and particularly if said generalisation is somewhat critical, but what the hell is it with these people? They are noisy. They are very, very noisy. Example. When I began at the English school in September I noted with disappointment that the only bus available to me would leave me there over an hour early, then with delight that there was a bar next door where I could have a coffee and get some of my own work or reading done while I waited. I’ve sat there almost every day since. At that time in the afternoon the place is always empty – at most there are five other people and that includes the landlord and the cook. One of the other people, it turns out, is a little boy who likes to bump into things, slam doors and scream. Then there is his mother who also enjoys screaming – back at him. Neither of them is ever asked to be quiet even though they make it impossible to follow the news on the TV. Instead the TV is turned up. The landlord, the cook and the one customer shout at each other even though none of them appears to be angry. To this is added the maddening repetition of “Premio!” (Prize!) from the slot machine which is constantly in use. Slam. Scream. Scream. Shout. Kerching. Kerching. Kerching. Premio! Shout. Scream. Scream. TV. Shout. Premio! Slam. Shout. Kerching. Kerching….on more than one occasion I’ve just got up and left. And those are the noise levels in a bar that is almost empty. The sense of being surrounded by noise is of course amplified through the persisting language barrier. Much is still incomprehensible to me, to us, as we enter the new year. We both listen to the radio on our commutes and pick out more than we used to. Our Spanish lessons have been inexplicably cancelled and we need to arrange something. Last week I was given a glimpse of what it might be like to have a clue what is going on around me. There was a show on the TV – one of those “Isn’t My House Nice?” reality television travesties. I understood it. All of it. It might seem trivial but it was sufficiently thrilling for me to sit through a half hour of vacuous interior decor chat. “Ooh! This room is very African”. “Yes. The lamp is from Morocco”. I take the earplugs out. The rhythms fade into an unbroken silence – the bar has closed and now I can get some sleep. No rest for us though as we embark on the coming year. We must acquire Spanish if this white noise is to sort itself out into something comprehensible, resolve itself into language. I look forward to the clearing of the aural mist and to being able – once again – to talk to people about things. As long as it isn’t interior decor. Then we can make some noise of our own. Poor you. I liked the bit about the ‘history’ of the bar. God, soem people are just sooo pretentious. Noise and Spain go hand in hand though, or should I say mouth in ear? Laughing here (although sorry you have to endure such noise)! From your description I could almost hear it all. Very loud post! Thanks Cathy. Spain makes noise – you just have to get used to it and I’m sure I will. We sympathize with you completely. When we were in Ecuador, I was shocked –SHOCKED i tell you – by how loud our neighbors were. The parties that start at 1am, the incessant clicking of impossibly high heels the thumping of stereos… I remember one night in particular when I walked down to plead with the doorman / security guard (as well as I could in a language I barely speak understand) to make the noise stop. He acted surprised by my frustration and did nothing, despite the fact that I could hear the partying 5 floors down in the lobby. The same experience in BsAs. The beautiful vampires don’t even start the party until the wee hours of the morning. Then the streets come alive with. There always seems to be someone playing reggaeton at 11, the dogs are barking from the noise, the rooftop dinner parties turn even more boisterous… At least in BsAs the windows have these amazing roll-down doors that block out all the light and some of the noise. All of this makes us feel very conflicted. It’s the culture. People are having a great time. We don’t want to be wet blankets. But when we are used to living in a zen-like quiet, the noise can be absolutely mad making. As always. great post. I had this one cued up to read over lunch and it did not disappoint. I can completely relate both about not being able to sleep because of nearby partying, and being excited when you understand even the most elementary of Spanish shows. We actually live next to an AA (alcoholics anonymous) and they party more than any one I know! I’m not a fan of noise! The last few places we have lived have been so noisy that we slept with earplugs every night. I’m currently enjoying a hiatus from them now that we’re travelling. As usual, I enjoyed the post. It makes me appreciate that there are advantages to getting older. One of them is that loud noises don’t bother me as much. And I forget the others. I had to laugh…I can remember Spain as being noisey.. but it’s just the way they are. Get up and join inj if it gets too much. Also there’s something picturesque at least about a rooster crowing. Pastoral or something. Not so with that #@%$! bar. Thanks Jozef. A set of earplugs is one of those things you almost certainly will not have the first time you need it, so get ahead of the game and buy some now! I can totally totally relate. In Vietnam everyone has industrial deafness and so wherever you go, whatever you do, anything with an adjustable volume is just that little bit too loud. As in headache-inducing loud. I couldn’t stay at my brother-in-law’s wedding because the band was so loud it made me nauseous! “The Dusk of Chillout.” Love it! I am currently living on Karaoke Street here in Chiang Mai. I relate perfectly!